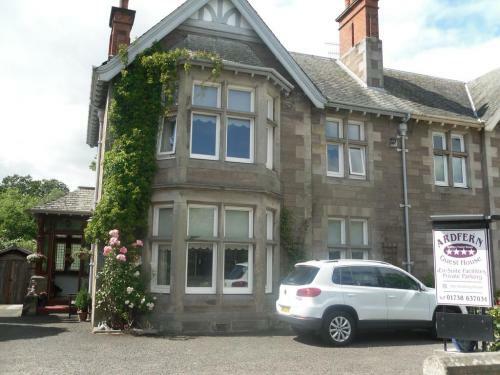 This spacious, comfortable Victorian guest house in Perth which is situated in a respectable residential area within easy walking distance of Perth city centre. Ardfern has been designed with the privacy of the guests in mind, with a relaxed friendly atmosphere which includes a large guest lounge with open fire, excellent cuisine and offers modern day comfort yet still retains its original features. Free WiFi available in all rooms. Guest lounge with open fire and satellite television. Tripadvisor Certificate of Excellency 2015. "Stayed one night in January. Warm, cosy, comfortable, clean and superb full breakfast.Would recommend." "Thank you for a wonderful weekend stay at your guesthouse.. truly the best we have ever stayed in by far. I would highly recommend to others and will return again"
This is a comfortable double room en-suite with toiletries provided which also accommodates single occupancy.Quietly situated at the rear overlooking the court yard.Complimentary hospitality tray provided.Free wifi and flat screen television.Ample private parking. A spacious twin room with private external bathroom situated adjacent (toiletries provided).The room is also open for single occupancy.Complimentary hospitality tray provided.Free wifi and flat screen television.Ample private parking. Spacious family room with en-suite facilities (toiletries provided) consisting double and single bed and also pull-down bed.Situated at front with bay window with open views.Room accommodates easy chairs for guests' comfort.Free wifi andflat screen television.Complimentary hospitality tray provided.Ample private parking.